Vintage Travel is thrilled to introduce the super stylish Villa Nuria to our portfolio of villas with private pools in Catalonia, North-East Spain. This beautifully-presented three-bedroom, three-bathroom villa sleeps six. Villa Nuria is located in an upmarket and extremely pretty residential area in the town of Begur, a stylish ‘hidden treasure’ on the Costa Brava, with an attractive spread of bustling tapas bars, chic boutiques and quality restaurants and bars. Internally and externally, Villa Nuria exudes style, sophistication and taste. Soft pastel hues of Mediterranean colours adorn every room, complemented perfectly with terracotta ties, chunky timber beamed ceilings and tasteful furnishings. This spacious villa has patio doors in the open-plan sitting/dining room which lead to an idyllic garden. There is essentially two focal points of Villa Nuria’s exterior, the inviting private pool, flanked by an emerald lawn, and the covered outdoor dining area with barbecue, where no doubt many a leisurely and memorable al-fresco meal will take place. Asides being such a comfortable and attractive Spanish villa, what’s great about Nuria is that is perfectly positioned to explore the many treasures this part of Catalonia is blessed with. Hailed by the Telegraph as one of the “prettiest medieval towns on the Costa Brava,” Begur, with its floodlit castle keeping a watchful eye on the town, is just 2.5km from Villa Nuria. After spending a relaxed morning meandering around Begur’s charming streets, you’ll be spoilt for choice of beaches and coves to head to on the spectacular Begur headland. Villa Nuria is available exclusively for 2018 and 2019 from mid-June until mid-September. 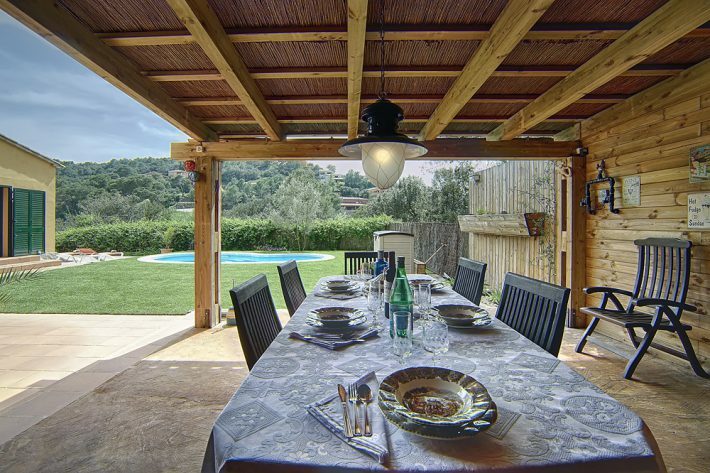 To take a look at the photos, check availability and book to stay at this chic and stylish villa just a stone’s throw from one of the Costa Brava’s best-kept secrets, visit Nuria’s webpage here.